Correction - Circuit is 26 years old! All IEEE members are invited to attend the Section Annual General Meeting, which will be held once again at The Castlereagh Inn, Masonic Club, 169 Castlereagh St, Sydney, on Friday, 28 November, commencing at 7 pm sharp. The Annual Dinner will follow the conclusion of the AGM, at approximately 8 pm. Both events are a great opportunity to meet other IEEE members. Members wishing to attend should complete the reservation form and forward, together with payment, to the Section Secretary, David Burger, by Friday 21 November. Prior to the Section AGM, Chapters will conduct their AGMs to elect new office bearers. Chapter Chairs are asked to conclude these meetings by 7 pm and also provide annual reports for distribution at the Section AGM. The dinner will be held in Cello's Dining Room. Partners not wishing to attend the AGM will be able to meet in a separate area where drinks can be purchased. The cost of the dinner is $35 per person, which includes drinks on the table. The Masonic Club is within two blocks of the Town Hall Railway Station, and car parking at $14 is available from 5 pm to 1 am at the Piccadilly Car Park, located adjacent to the David Jones store in Castlereagh Street. Alternatively, low-cost parking is available three blocks away at Goulburn Street City Car Park. I have just returned from the annual Region 10 gathering of Asia Pacific Section Chairs, postponed from April due to SARS. These meetings provide a useful opportunity for Section Chairs to exchange information and discuss broad issues relating to IEEE membership and activities. This year, there was an extensive focus on student activities and student branches, as well as on GOLD activities and the benefits of maintaining membership through the early years of a professional career. One of the aims of IEEE is to provide networking opportunities for early career professionals to meet and share experiences, and to engage with more senior colleagues - we hope that the GOLD functions and student functions we offer in New South Wales are achieving some of this, and we would also encourage more members to attend Joint Technical Program meetings for this reason. Australian delegates at the recent Region 10 Meeting. From left: Harry McDonald (Past-chair Australia Council and R10 Newsletter Editor), Douglas Chai (Chair WA Section), Peter Wills (Chair Vic. Section and Secretary/Treasurer Australia Council), Renate Sitte (Vice-chair Qld. Section), Andrew Parfitt (Chair NSW Section), John Robinson (Chair Australia Council), Erik Lensson (Chair ACT Section), Mal Heron (Chair Nth. Qld Section), Michael Evans (Chair SA Section). Each year we run a multi-tiered student paper contest - papers submitted are entered into the local competition for the Max Simons award, the Australia Council competition evaluates the best entries from Sections across Australia, and the Region 10 competition chooses its winners from its Sections across the Asia Pacific region. I am very pleased to announce that the second prize winner of the 2002 Region 10 Competition for postgraduate students is Parastoo Sadgehi from the University of New South Wales, for his paper 'A novel method for receiver training in flat fading channels modeled as finite state Markov processes'. The winners of the Australia Council and local competitions will be announced shortly. While the responsibility for accreditation of university courses lies with Engineers Australia as the national society, the IEEE has to maintain a register of institutions and courses in order to ensure that students applying for full member upgrades can be assessed and advanced in an expedient manner. I am pleased to advise that Macquarie University has been entered on the register, together with the appropriate degree courses offered there. In the coming months there will be a number of important functions. The IEEE President, Dr Mike Adler, will be visiting us on 30 October, and a lecture, followed by drinks, will be held at the Duxton Hotel starting at 6pm. Please advise me if you are intending to join us. The AGM will be held on 28 November. This is an important meeting, and will be followed by a dinner. Please put this in your diary now. Finally, our Past Section Chair, Dr Trevor Bird, has been awarded the distinction of being the Engineers Australia (Sydney Division) Professional Engineer of the Year. We heartily congratulate Trevor for this additional recognition of his capabilities and leadership. As we come to the end of another busy year, I wish you all the compliments of the coming season. 3. CORRECTION - CIRCUIT IS 26 YEARS OLD! In the July issue of Circuit, for the first time a Volume number was added to the header on the front page. Our initial research indicated that Circuit had been published since 1981. However, further information came to light that showed the first issue of Circuit was much earlier, in 1978. A copy of an early issue has been placed on the web site for your interest. The NSW Section Historian, Zach Zakarevicius, is seeking to obtain copies of the first ten years of this magazine. If you have any copies of Circuit for the years 1978 to 1988, please contact the Editor (ts.bird@ieee.org). Life Senior Member Brigadier Roger Stuart Philip Amos R.E.D, E.D. passed away on 18 August 2003 aged 76 years. 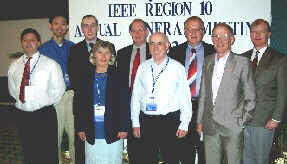 Phil was one of the foundation committee members when the IEEE Australia Section was formed in 1972. In recent times he was Vice-Chair of the IEEE NSW Section Life Members Committee. Prior to his retirement, he was Executive Director of EMAIL Ltd, having previously been Group General Manager - EMAIL Electrical Engineering and Associated Industries for many years. He was elected as Member of AIEE (now IEEE) in 1955 and became a Senior Member of IEEE in 1971 and a Life Senior Member in 1991. Besides his membership of IEEE, Phil was a Fellow of both Engineers Australia and IEE. Phil was very well known and widely respected throughout the electrical manufacturing industry and will be sadly missed by his many colleagues. 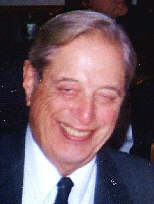 Life Member George Gemes, who died on 16 September 2003 aged 89 years, was a member of IEEE for over 50 years. He was elected Member of AIEE in 1946 and became a Life Member in 1981. I'm pleased to report that new student branches are starting up at Macquarie University, Charles Sturt University and the University of Western Sydney. We participated in the UNSW Association's Market Day, held on 15 October. This was a very successful day. We met many bright, interested students and introduced them to the benefits of IEEE membership. Much thanks goes to the committee members of the UNSW IEEE student branch, for their involvement on the day. On 28 August we had a joint function with the GOLD group. There is a detailed report on this successful event in the GOLD section elsewhere in this issue. We are still seeking volunteers to be Campus Counsellors to support the work of Student Branches at the University of Sydney, University of New South Wales, University of Technology Sydney, University of Western Sydney and Wollongong University. The Student Counsellor role involves encouraging student members and promoting the IEEE among students at the university. The GOLD affinity group has met a number of times as well as canvassed opinions of the wider group via email. Recently, a research and employment opportunities' presentation was held on the evening of 25 August 2003 at the Duxton Hotel, Milsons Point. This was a joint GOLD-student member event and approximately 30 student and GOLD members were present on the night. The group was fortunate enough to have two guest speakers: Prof. Gernot Heiser from the UNSW School of Computer Systems Engineering, and currently seconded full-time to National ICT Australia (NICTA), and Dr. Nick Hauser from the Australian Nuclear Science and Technology Organization (ANSTO). Prof. Heiser spoke of the work performed in his research group in systems engineering, both at the undergraduate and postgraduate levels. He also outlined the role and structure of NICTA and its aims to graduate many PhD students in the coming years. Similarly, Dr. Hauser described the instrumentation, control and software engineering work undertaken in ANSTO. Some opportunities for undergraduate summer vacation work and entry-level graduate positions were provided at the end of his talk. After the presentations, members stayed to enjoy the food and drinks that were provided, as well as the opportunity to meet new people. Overall, the event was a success and other events such as these will be held in the future. Anyone who is interested in participating in the IEEE NSW Section GOLD Affinity group, please contact me. 11 Mar. 2004 Wireless LAN Adaptive Antennas Dr David Skellern, CISCO Engineers Aust. Synopsis: Fundamental limits on the capacity of wireless channels were established by Claude Shannon, of Bell Labs, in 1948, marking the birth of information theory. These limits still apply today. However, in the mid 1990's Gerry Foschini and colleagues, also of Bell Labs, devised ingenious ways of exploiting multiple antennas at each end of a radio link to multiply the capacity achievable in a volume of space. Furthermore, the BLAST family of algorithms was proposed as computationally feasible methods of detecting the signal components sent between the multiple antennas. With advances in digital signal processing, Bell Labs Australia has recently prototyped silicon devices proving the feasibility of even higher performance algorithms for system configurations currently under consideration for third generation (3G) mobile wireless systems. This talk will track the advances in wireless capacity made possible through the use of multiple antenna technology and introduce the prototype chipset designed by Bell Labs Australia. Biography: Graeme K. Woodward (MIEEE) holds B.Sc, B.E and Ph.D. degrees from The University of Sydney. From 1991 to 1994 he worked at Alcatel Australia in digital switching systems. During PhD studies he was a visiting researcher at Yokohama National University, Japan, in 1996 and at Northwestern University, USA, during 1998. From 1999-2000 he worked with Southern-Poro Communications, Sydney, in channel modeling, 3G cellular systems and multiuser detection for CDMA, in collaboration with The University of Oulu, Finland. In 2001 he joined Bell Laboratories Research, Lucent Technologies, Sydney, Australia, researching 3G systems, multi-antenna systems, multiuser detection, interference suppression and adaptive digital filter algorithms for equalization. In this presentation, Dr Town will review recent and ongoing developments in the field of broadband guided-wave optics, particularly optical sources and novel waveguides and waveguide devices for transmission and signal processing of optical signals with large optical bandwidths. The presentation will include both theoretical and experimental results generated in the course of research by Dr Town and his students on topics such as soliton lasers, multiwavelength lasers, optical supercontinuum generation, ultrafast all-optical switching, and coupled-mode filter design for broadband signal processing. A particular focus will be placed on the unique properties and applications of microstructured or "holey" optical fibres in applications such as telecommunications and optical tomography. Biography: Associate Professor Graham Town is with the Department of Electronics at Macquarie University. His research interests are primarily in the area of broadband guided-wave linear and nonlinear optics, with applications in telecommunications and biomedical engineering. He was previously with the Department of Electrical Engineering at Sydney University where he worked on optical fibre devices and systems, and had been part of a team which built a small nuclear magnetic resonance imaging system. Prior to that he was employed in the Australian electronics and telecommunications industry. Our traditionally brief AGM will be held on Friday, 28 November 2003, at 6.00 pm, prior to the Section AGM. Come and join us, have your say, with good food and fine wine to follow. This year the Chapter has provided several speakers for the Joint Institutions technical meetings and separate meetings have not been held so far. However, the Chapter Committee is planning a talk to be held in December at CSIRO Radiophysics Laboratory, Corner Vimiera and Pembroke Roads. Details of this talk will be emailed to Chapter members and listed on the NSW Section web site in late November. There is a possibility of a lecture coming up in December, in association with the Symposium on Consumer Electronics. I will keep you posted and also please watch the News page of the NSW Section web site. 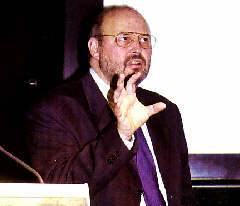 Thomas Cain 1995 (accompanied by Convocation that included Troy Nagel 1994, Wallace Read 1996, Kenneth Laker 1999, Bruce Einstein 2000, Joel Snyder 2001). The September 2003 issue of THE INSTITUTE (page 12) carries portraits of all Past Presidents since the creation of IEEE in 1963 from a merger of the IRE and the AIEE. Forty-one years ago, members voted on the merger following many years of discussions (see the leading article in the same issue of the THE INSTITUTE). Stephanie Boyd is a software engineer who is very active in the IEEE NSW Section Committee. Early in her career, she became responsible for customer support with the GMB research & Development, who supplied records management and document imaging software to a worldwide clientele, including the US drug Enforcement Administration, the UK Inland Revenue, the Queensland and Victorian Health departments and the whole of the South Australian government. After leaving GMB she formed a software consulting company called 'Information Systems Builders' in partnership with another engineer. As a freelance consultant with this company she has created television graphics software for Channel 9's cricket broadcasting, participated in the creation of what is believed to be the first ever software to sell insurance over the Internet, played a part in the software for the Sydney Olympic Games and been a factor in many other major and innovative projects. Stephanie joined the NSW committee of the IEEE Computer Society at the beginning of 2002. She is Chair of the NSW Computer Chapter in 2003 and is also Chair of the student activities sub-committee of the NSW Section. She is a firm believer in professional societies and the role of these societies in striving towards the betterment of the industry and society as a whole. Many judged engineering Week 2003 as the most successful yet held. The highlights were the Harricks Address, given by IEEE Senior Member Associate Professor Sam Reisenfeld, and a forum that examined the future uses of Sydney Harbour. Each year, Engineers Australia leads an organizing team that includes an IEEE representative (for the past three years this has been Jim Logothetis) that produces a program of nine days of activity to show to the general public some of the work of the engineering profession. Associate Professor Sam Reisenfeld gives the Harricks address (photo courtesy of Engineers Australia). The topic of the Harricks address was 'Experimental Radio Communications with the Australian FedSat Satellite'. Associate Professor Sam Reisenfeld and his team from the University of Technology have been responsible for developing two tracking earth stations that will be used to run the FedSat communications experiments over the next three years. The FedSat microsatellite is the first Australian-built satellite in more than 30 years and was launched in December 2002 for the Cooperative Research Centre for Satellite Systems (CRCSS). The UTS earth stations operate in Ka-band which is an emerging frequency band for satellite communications. The Ka-band link will be used to demonstrate future high-speed communications via satellite for rural and remote communications in Australia. The Ka-band transponder on board FedSat was developed by CSIRO Telecommunications and Industrial Physics. The Forum discussed 'It's time to decide what we want from our harbour'. Speakers included Wayne Johnson of the Sydney Harbour Foreshore Authority, Dominic Johnson and Rob Bennet of Planning Australia and Ian Kiernan of Clean Up Australia. The week concluded with the 'Brain Strain' trivia night which attracted over 20 teams. Access to the latest technology is one of the benefits of IEEE membership. IEEE publishes the top eight journals in electrical and electronics engineering and the top seven journals in telecommunications, according to recently released results from the Institute for Scientific Information's annual Journal Citation Reports (2002 edition). The ISI study ranks journals by their impact factor - the number of times their papers are quoted or cited by other scientific publications in their initial year of issue publication. You can view the report in more detail at http://www.ieee.org/citations. All members are encouraged to make use of the IEEE Personal E-mail Alias Service. There are many advantages of this service including the virus-screening feature. Last September, virus screen had ample opportunities to flex its muscles as it turned away a record number of Internet virus attacks. To find out how this free benefit protects members' e-mail, click here. Congratulations are extended to Professor Yianni Attikiouzel (Fellow) of the Western Australia Section who was presented with the 2002 MA Sargent Medal on 20 June. The Electrical College of Engineers Australia awards this medal annually to an electrical engineer who has made a significant contribution to the practice and/or science of electrical engineering. The 2003 IEEE International Symposium on Consumer Electronics (ISCE'03) will now be held in Sydney, Australia, from 3 to 5 December 2003. The Symposium venue is the Grace Hotel, 77 York Street, Sydney. ISCE is the premium forum for researchers, system developers, and service providers to share ideas, designs, and experiences on the emerging technologies for consumer Electronics. ISCE originally aims to be the consumer electronics industry's premier technical conference in the Asia Pacific Region, but has since expanded to include the Europe region where ISCE'02 was held in Erfurt, Germany, and for the first time, will be held in the southern hemisphere in Australia. The conference will bring together top technical professionals from the consumer electronics industry and academics to exchange information and results of recent work on systems, circuits, technology, processes and applications in all areas of consumer electronics. Technical papers are invited for all areas of interest in traditional and new consumer electronics products such as Digital Video Disk, Interactive TV, HDTV and digital-video consumer products. For further details and registration form please visit the ISCE'03 web site. DICTA 2003 is the seventh biennial conference on Digital Image Computing - Techniques and Applications to be held in Sydney by the Australian Pattern Recognition Society. The conference will feature keynote addresses and technical presentations. Keynote speeches will be delivered by experts in their fields. DICTA 2003, http://www.tip.csiro.au/dicta2003, will be held in conjunction with ANZIIS; view the website at http://www.eese.bee.qut.edu.au/anziis2003/. The IEEE NSW Section is a technical co-sponsor of the conference. Object Recognition, Scene Understanding, Photogrammetry, Multimedia, Image Segmentation, Image Registration, Medical and Biomedical Imaging, Mathematical Morphology, Computer Graphics, Visualization, Virtual and Immersive Environments, Digital Video Communications, Multi-view and Stereo Vision, Motion Analysis and Surveillance, Automation and Robotics, Imaging Applications. Please see the web site given above for further details. Once again, at this time of year, entries are now invited for three student paper competitions. Two are provided by the IEEE Australia Council and the third, the Max Simons Prize, by the IEEE NSW Section. The aims, the conditions of entry and the method of submission are the same. These and other details are given below. (c) To promote IEEE membership throughout Australia. For the undergraduate competition, a $500 cash prize is awarded to the student author of the paper judged to be the best submission. For the postgraduate competition a cash prize of $500 is also awarded, together with up to $1000 support for the winner to travel to an IEEE-sponsored Australian or International conference of his/her choice in 2004, provided that the student presents their paper at that conference. The IEEE Australia Council/NSW Section reserves the right not to award either prize if it believes that there is no paper of a suitable status. The best paper submitted from the New South Wales Section will be eligible for the Max Simons Prize. This includes $200 cash and a certificate. Each of the Best Paper winners of the two competitions (Undergraduate and Postgraduate) is awarded a Certificate from the IEEE Australia Council. In addition a Certificate of Rank is awarded to each of the first and second runner-up student papers of the two competitions. The IEEE Australia Council Student Paper Competition is open to all IEEE Undergraduate and Postgraduate Student Members studying in Australia. Separate undergraduate and postgraduate prizes will be awarded. Papers must be submitted in the first instance to the IEEE Section in which their institution is located if a Section level contest is held. The best and the first runner-up undergraduate and postgraduate papers from each Section will then be sent to the IEEE Australia Council where the final decision will be made. In case where there is no section level contest, the student authors may send their papers directly to the IEEE Australia Council. The papers will be judged on technical merit (50%) and presentation (50%). Email: by 12 December 2003 so that the short-listed papers can be forwarded to the IEEE Australia Council committee. NSW Section should receive six copies of hardcopy or a softcopy (pdf file) of the Technical Paper in IEEE standard paper format. The IEEE Format is available here, other web sites of IEEE. All entries must be accompanied by a certificate from an IEEE Student Branch Counsellor or Faculty Member of the entrant's home institution, confirming the entrant is an IEEE Student Member and indicating which competition (undergraduate or postgraduate) the student is entering. The entrant's IEEE Student Membership Number must be stated in the certificate. If the student is in the process of becoming an IEEE student member, then a photocopy of the duly completed application must accompany the manuscript. The paper may report on the entrant's undergraduate thesis or postgraduate research on a topic in the areas of electrical, electronic engineering, computer science or allied subjects in the fields of interest of the IEEE Technical Societies. The paper must be the student's own work, and the student should declare this in a cover letter with the submission. The maximum length of the paper is six A4 pages including all text and figures. Six printed copies or one softcopy (pdf file) of the technical paper in accordance with the Contest Rules must be received by the NSW IEEE Section no later than 12 December 2003. In the event of a student failing to submit before this deadline due to a valid reason (e.g. medical reasons), the student may still submit the package to the IEEE Australia Council (contact below). This special interest group has been established for organizations to consider and share best practices in Project Management. The next meeting of the group is 10 November. If you would like further details, please contact Phil Bryant on ph. (02) 9981 4114, or email filbe@tpg.com.au.